L McCleary, J Blum, J Holland. Evaluation of a Putative Nutrient Partitioning Agent. The Internet Journal of Nutrition and Wellness. 2006 Volume 4 Number 2. Background: There is an epidemic of overweight and obesity in America and Western societies for which there is no obvious solution. Pharmaceuticals are on the market to address this condition but are occasionally associated with serious adverse effects. These observations suggest other therapeutic modalities might be helpful. The current approach is a nutrient-based formulation designed to assist in weight reduction. Aim of the study: To evaluate the weight loss promoting effect of a nutrient composition with putative ability to beneficially modulate nutrient partitioning as one component of a weight loss program. Materials and Methods: The study design was prospective, randomized, placebo-controlled and double-blinded. 70 volunteers, apparently well and community dwelling, aged 21 to 72 years wee screened. From this group there were 56 subjects who met the inclusion criteria. Randomization provided two equally matched groups of 28. One group was given active product while the other received placebo. Body height, weight, upper mid-arm and waist circumferences were measured at baseline and at biweekly intervals. Nutritional counseling and exercise recommendations were provided equally and were followed similarly by each group. End points consisted of changes in lipid parameters and weight and circumference measurements. Results: The nutrient mixture produced a statistically significant weight loss effect during the six-week trial. Conclusions: These study results document the efficacy of the nutrient composition as a component of a weight loss program and establish the foundation for further studies designed to investigate mechanistic possibilities. Obesity is currently one of the most prevalent problems affecting health in the United States. A staggering 90 million Americans are now considered obese. Obesity related conditions such as glucose intolerance, hyperinsulinemia, non-insulin dependent diabetes mellitus (NIDDM), hypertension, dyslipidemia and vascular disorders are responsible for increasing morbidity and mortality in western society. [2,3,4,5,6,7,8,9,10] Not only are individuals affected but also, because of the associated health care costs, governments are being fiscally impacted by the current epidemic of obesity. Ten years ago, one in four Americans was considered obese; now that figure is one in three. There are a number of contributing factors, yet there is no obvious resolution. Clearly, our bodies are not well adapted to our current dietary and lifestyle choices. These observations provide a mandate for the creation of unique new therapeutic approaches to mitigate the accumulation of adipose tissue. The purpose of the current study is to pursue the application of these concepts. A composition containing biotin, L-carnitine, aspartic acid, chromium, and Garcinia cambogia extract was formulated. The relative amounts and ratios of the individual ingredients were chosen to maximally stimulate hepatic fatty acid oxidation, inhibit lipid synthesis and induce metabolic thermogenic activity. The primary outcome being investigated in this clinical trial was that of facilitated weight loss. The trial design was prospective, randomized, placebo-controlled and double blind in nature. The duration was six weeks. Equal numbers of subjects were randomized into the active and placebo arms. Each was required to sign informed consent. Approval was received from the Triad Institutional Review Board in Springfield, Illinois. Participants were recruited from local physician practices and from the general population. They each were required to satisfy the inclusionary and exclusionary criteria and to pass compliance testing. All subjects were treated equally and confidentiality was assured. They were free to leave the study at any time. Each subject had been essentially sedentary, weight stable and without recent dietary changes prior to initiation of the study. Diet counseling was provided and consisted of recommendations to restrict intake of refined carbohydrates and hydrogenated fats. No caloric guidelines were included. Lean protein sources and fruits and vegetables were emphasized. However, to maintain their daily routine, participants chose and prepared their meals at home. Exercise was performed and consisted of 20 minutes of light aerobic training three times per week and ten minutes of light resistance training two times per week at the trial center facility. Compliance was confirmed through biweekly contacts. All participants were required to attend meetings prior to initiation of the study and every other week for the duration of the clinical trial. These reinforced the dietary and exercise components of the study, disseminated information, and provided support for the continued participation of the subjects. Each participant took one dose of active product or placebo in a glass of water twice per day. One dose of active product consisted of: biotin-600mcg, chromium chloride-400mcg, aspartic acid-4g, Garcinia cambogia fruit extract (50% hydroxycitrate)-500mg, and L-carnitine tartrate-10mg. Weight, limb and waist circumference were measured at baseline and at two weekly intervals throughout the study. Vital signs (HR, BP) were monitored sequentially throughout the duration of the trial. Baseline and off-study lab values were performed. These included CBC, liver profile, electrolytes, BUN, creatinine, glucose, cholesterol and triglycerides. Twenty-eight subjects were randomized into each of two groups at the start of the trial. Twenty-two and twenty-one respectively (product, placebo) completed the second visit, and twenty and seventeen completed the third follow-up visit. The loss rates were similar between the two groups and potential biases were not observed. All statistical analyses were conducted with the Statistical Analysis Systems software (SAS; Cary, NC). Tests for differences of means for continuous data were conducted using paired or unpaired t-tests, while chi-square tests were utilized for categorical data. Fisher's exact two-tail chi-square was used for comparisons with small cells. Weight loss over the entire six-week course of the study was steady and uniform. Weight loss per week per individual on placebo was 1.0 pound. For the active product, the same figure was 1.72 pounds. Thus, the nutritional product was responsible for an average net weight loss of 0.72 pounds per week over placebo. 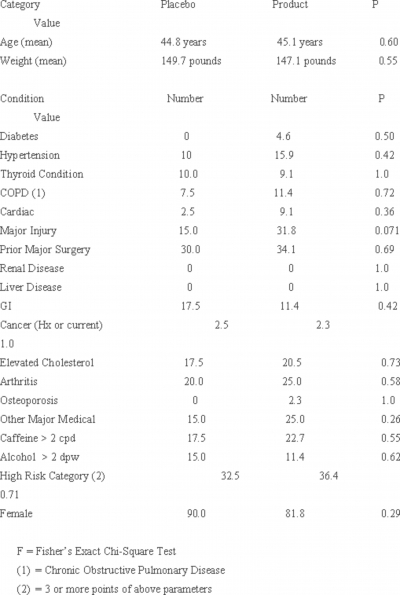 (See Table II) The arm and waist circumference data revealed no statistically significant differences. (See Tables III and IV) There were no adverse reactions attributable to the nutrient composition. There was no statistically significant change in heart rate or blood pressure in either group. There was a downward-trend in serum total cholesterol level. The value in the active arm was 27 mg/dl lower than in the placebo group (p=0.06). (See Table V) Otherwise, there were no significant differences or changes noted in lab values either between arms of the study or over the course of the study in either group. The clinical trial documented a clear weight loss effect of the nutrient composition. It also appeared to be well tolerated. These results are of interest because several of the ingredients have shown inconsistent weight loss activity when used as stand alone agents. This suggests the presence of significant synergistic interactions when they are used in combination and administered in specific ratios. The active sites involving each of the nutritional components in association with their respective metabolic effects suggest several possible mechanistic actions. The liver is the organ most likely mediating the activity of the nutrient composition. It has the biochemical apparatus that enables it to either oxidize or esterify fatty acids and synthesize or break down glucose. Modulation of the enzyme glucokinase (GK) by the nutrient mixture is postulated as playing a key role in its overall activity. This enzyme is present in liver but is absent from adipose tissue and skeletal muscle. Any changes induced in the esterification/oxidation (E/O) ratio would alter hepatic tissue TG levels with potentially beneficial impact upon hepatic insulin sensitivity. [12,13] Due to the ability to activate ketogenesis and dissociate it from hepatocyte respiratory chain activity, the ratio of pyruvate dehydrogenase to pyruvate carboxylase activity (PDH/PC) may be manipulated. This ratio represents the relative effect, catabolic or anabolic, the liver has on glucose metabolism at any moment. 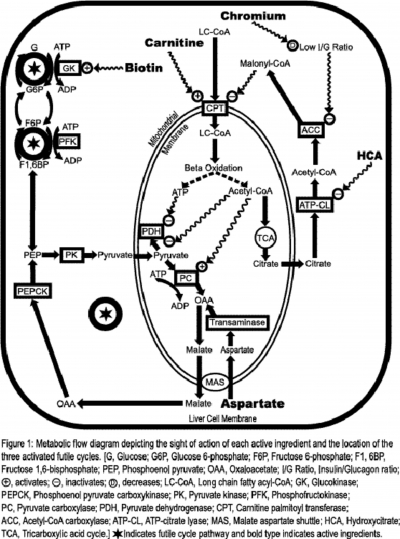 Hepatic ketogenesis has anabolic effects upon glucose metabolism. The converse is also true. This implies that enhanced FA oxidation in liver is associated with increased gluconeogenesis and subsequent expansion of hepatic glycogen stores. These actions typify the reciprocal effect the liver has upon the metabolism of these two key nutrients. To promote better understanding of not only the pyruvate/DHAP activity, but to incorporate the ingredients of the current weight loss mixture into a more complete hepatic weight loss paradigm involves dissection of the plethora of beneficial interactions the nutrient components manifest. J.D. McGarry has provided the biochemical framework into which the current presentation was embedded. [22,23,24] To facilitate understanding and provide overview for the following discussion, the anticipated benefits provided by the ingredients in the nutrient mix include enhanced FA oxidation (while restraining esterification) and increased hepatic glucose storage (while limiting glucose oxidation). The anticipated consequences emanating from these changes include decrement in respiratory quotient (RQ), diminution of tissue TG level, and weight loss. Central factors regulating control of hepatic lipid utilization involve modulation of carnitine palmitoyl transferase-1 (CPT1) activity. This enzyme represents the rate-controlling step in the pathway of long chain FA oxidation. (See Figure I) Intracellular hepatocyte carnitine and malonyl CoA concentrations play key regulatory roles via their effects on CPT1. Carnitine is the co-factor for CPT1 and is usually present in subsaturating amounts in the liver. Enhancement of FA oxidation and ketogenesis in liver is accompanied by a proportional elevation of tissue carnitine content. When added to rat hepatocyte perifusate, carnitine was shown to stimulate ketogenesis from oleic acid. These findings suggest that the increased FA flux through CPT1 was mediated, at least in part, by the liver carnitine concentration. Additional investigations support the contention that the moment-to-moment regulation of gluconeogenesis is closely linked to concurrent intracellular hepatic fat metabolism. Addition of carnitine indirectly stimulated gluconeogenesis via activation of fat combustion. At sufficient concentration, carnitine augments FA oxidation and gluconeogenesis. Malonyl CoA acts as a potent allosteric inhibitor of CPT1. Thus, malonyl CoA levels and CPT1 activity vary inversely. The rate of TG synthesis correlates positively with the malonyl CoA concentration. Both of these parameters are inversely correlated with the rate of FA oxidation. Malonyl CoA levels therefore influence FA oxidation and esterification in reciprocal fashion. Many factors affect malonyl CoA levels. Its instantaneous concentration is determined by the interaction between synthesis and degradation. Malonyl CoA decarboxylase (MCD) degrades malonyl CoA. It has been proposed as playing a role in the modulation of malonyl CoA levels. Little is known about its controlling mechanisms. However, in all tissues studied to date, except for the europygial gland of the goose, it is predominantly a mitochondrial enzyme. Thus, its role in degrading malonyl CoA produced by ACC, which is thought to be an extra mitochondrial enzyme, is unclear. Synthesis of malonyl CoA is dependent upon the level and activity of the enzyme ACC as well as the concentration of its cytosolic substrate, acetyl CoA. ACC forms malonyl CoA from acetyl CoA. It is then in a location where it may directly modulate CPT1 activity. ACC is modulated by both transcriptional and post-transcriptional controls, which collectively contribute to the mRNA and protein concentrations as well as enzymatic activity. Upregulation occurs under conditions of enhanced glycolytic flux and a high insulin/glucagon (I/G) ratio. Augmentation of dietary protein intake tends to increase the serum glucagon level. Factors which improve IS are expected to promote a fall in insulin level. Restriction of refined and high glycemic index carbohydrate intake amplifies this effect. Trivalent chromium has the ability to promote clinical insulin sensitivity. In vitro studies have shown it can improve insulin response in muscle and adipose tissue. Chromium supplementation in women with gestational diabetes lowered serum insulin levels. By it's beneficial action on IS associated with a fall in serum insulin levels and a decrease in I/G ratio, chromium acts to lower ACC activity, producing subsequent beneficial effects upon malonyl CoA levels. Hydroxycitric acid (HCA) is a component of the fruit of Garcinia cambogia. It is a potent competitive inhibitor of ATP-citrate lyase. It blocks the conversion of cytosolic citrate to acetyl CoA, the substrate for ACC. This limits production of malonyl CoA. The combined actions of carnitine, HCA, chromium and a lowered I/G ratio synergistically disinhibit FA oxidation via their combined actions upon CPT1. Ketogenesis is potently stimulated. While ATP generation from acetyl CoA is coupled to the production of hepatocyte ADP, ketogenesis seems to be substantially independent of respiratory control. From an evolutionary perspective, this makes sense. Consider the profound impact upon the brain if, during starvation, glucose production (coupled with ketogenesis) was limited by hepatocyte respiratory activity. The activation of mitochondrial beta-oxidation in the liver generates both acetyl CoA and ATP at high rates. By these actions, inhibition of pyruvate dehydrogenase (PDH) and activation of pyruvate carboxylase (PC) are achieved. This puts the liver into an anabolic glucose mode. PC utilizes pyruvate as substrate for the generation of OAA. Under conditions of congenital PC deficiency, medical therapy using supplemental aspartate has been effective in ameliorating the associated metabolic abnormality due to its ability to be transaminated directly. [21, 30] This bypasses the PC step allowing unconstrained production of the OAA that is lacking in PC deficiency syndromes. In the current setting, this effect of aspartate tends to enhance gluconeogenesis, thus providing synergism with the other nutritional components. Due to the high redox potential in ketogenic mitochondria, much of the OAA generated is reduced to malate and transported to the cytosol via the Malate Shuttle. These combined actions increase flux through gluconeogenic pathways and expand hepatic glycogen stores via the indirect pathway. When pharmacologic doses are used, the B vitamin biotin increases the expression of GK, which increases hepatic glycolytic flux. Activity of several futile metabolic cycles is upregulated by the simultaneous induction of opposing carbohydrate pathways (glycolysis and gluconeogenesis). These include the G6P to G to G6P cycle, the F6P to F1,6DP to F6P cycle and the metabolic loop involving phosphoenolpyruvatecarboxykinase (PEPCK) and pyruvate kinase (PK) utilizing OAA via the Malate Shuttle. (See Figure 1) Each of these futile pathways expends one ATP molecule with every turn of the cycle. The subsequent production of ADP activates the generation of ATP via the TCA cycle. In the setting of ketogenesis this process, coupled with the activity of the futile carbohydrate cycles, results in selective oxidation of fat and generation of heat. This represents the metabolic activation of hepatic thermogenesis. It is clear that there is potent synergism in the combined utilization of the five active ingredients. The combination of the hepatic catabolic action upon fat combined with its anabolic effect upon glucose alters the composition of the fuel mix. Enhanced contribution from fat and diminished glucose input act to lower the RQ. Since increased fat oxidation is intimately coupled with a fall in FA esterification, hepatic TG content and subsequent VLDL production are expected to fall. These changes would be expected to improve hepatic insulin sensitivity. [12,13] The increased ketogenesis upregulates hypothalamic satiety centers by provision of enhanced ketone flux with subsequent neuronal ketone body oxidation. This limits the fall in neuronal energy stores in the hypothalamic nuclei regulating appetite and maintains satiety. [34,35,36] Expansion of hepatic glycogen stores provides an additional satiety signal transmitted to the brain via hepatic afferent fibers of the vagus nerve. These factors combine to suppress appetite and reduce energy intake. Pursuant to the above considerations, the combined effects of the nutrient composition should act to lower RQ, diminish appetite and upregulate thermogenesis in the liver without any associated systemic autonomic stimulation. Because fat oxidation is enhanced, adipose tissue depots with high lipolytic activity are preferentially affected. This includes visceral fat stores - those with maximal deleterious metabolic impact. Because the upregulation of FA oxidation utilizes a “pull” rather than a “push” mechanism upon adipose tissue, serum FA and TG levels should fall. The nutrient composition evaluated in the current limited weight loss trial was well tolerated and produced significant weight loss. There was a fall of 27 mg/dl of total cholesterol over the six week interval of the study. These results provide the foundation for subsequent investigations designed to analyze potential mechanisms of action. 1. Mokdad AH, Serdula MK, Dietz WH, Bowman BA, Marks JS, Koplan JP. The spread of the obesity epidemic in the United States, 1991-1998. JAMA 1999;282:1519-1522. 2. Kahn BB, Flier J. Obesity and insulin resistance. J Clin Invest 2000;106:473-481. 3. Olefsky JM. Treatment of insulin resistance with peroxisome proliferator-activated receptor gamma agonists. J Clin Invest 2000;106:467-472. 4. Reaven, GM. Banting lecture 1988. Role of insulin resistance in human disease. Diabetes 1988;37:1595-1607. 5. Ruderman NB, Schneider SH, Berchtold, P. The "metabolically-obese," normal-weight individual. Am J Clin Nutr 1981;34:1617-1621. 6. Ruderman N, Chisholm D, Pi-Sunyer X, Schneider S. The metabolically obese, normal-weight individual revisited. Diabetes 1998;47:699-713. 7. Srinivasan SR, Myers L, Berenson, GS. Temporal association between obesity and hyperinsulinemia in children, adolescents, and young adults: the Bogalusa Heart Study. Metabolism 1999;48:928-934. 8. Young-Hyman D, Schlundt DG, Herman L, De Luca F, Counts D. Evaluation of the insulin resistance syndrome in 5- to 10-year-old overweight/obese african-american children. Diabetes Care 2001;24:1359-1364. 9. Cavallo-Perin P, Bergerone S, Gagnor A, Comune M, Giunti S, Cassader M, Pagano G, Pacini G. Myocardial infarction before the age of 40 years is associated with insulin resistance. Metabolism 2001;50:30-35. 10. Isomaa B, Almgren P, Tuomi T, Forsen B, Lahti K, Nissen M, Taskinen MR, Groop L. Cardiovascular morbidity and mortality associated with the metabolic syndrome. Diabetes Care 2001;24:683-689. 11. Mokdad AH, Bowman BA, Ford ES, Vinicor F, Marks JS, Koplan JP. The continuing epidemic of obesity in the United States. JAMA, 2000;284:1650-1651. 12. Marchesini G, Brizi M, Morselli-Lebate AM, Bianchi G, Bugianesi E, McCullough AJ, Forlani G, Melchianda N. Association of nonalcoholic fatty liver disease with insulin resistance. Am J Med 1999;107:450-455. 13. Marchesini G, Brizi M, Bianchi G, Tonasetti S, Bugianesi E, Lenzi M, McCullough AJ, Natale S, Forlani G, Melchianda M. Nonalcoholic fatty liver disease: a feature of the metabolic syndrome. Diabetes 2001;50:1844-1850. 14. Berry MN, Clark DG, Grivell AR, Wallace PG. The contribution of hepatic metabolism to diet-induced thermogenesis. Metabolism 1985;34:141-147. 15. Stanko RT, Mendelow H, Shinozuka H, Adibi SA. Prevention of alcohol-induced fatty liver by natural metabolites and riboflavin. J Lab Clin Med 1978;91:228-235. 16. Goheen SC, Pearson EE, Larkin EC, Rao GA.The prevention of alcoholic fatty liver using dietary supplements: dihydroxyacetone, pyruvate and riboflavin compared to arachidonic acid in pair-fed rats. Lipids 1981;16:43-51. 17. Kalman D, Colker CM, Wilets I, Roufs JB, Antonio J. The effects of pyruvate supplementation on body composition in overweight individuals. Nutrition 1999;15:337-340. 18. Cortez MY, Torgan CE, Brozinick JT Jr, Ivy JL. Effects of pyruvate and dihydroxyacetone consumption on the growth and metabolic state of obese Zucker rats. Am J Clin Nutr 1991;53:847-853. 19. Stanko RT, Tietze DL, Arch JE. Body composition, energy utilization, and nitrogen metabolism with a 4.25-MJ/d low-energy diet supplemented with pyruvate. Am J Clin Nutr 1992;56:630-635. 20. Demaugre F, Buc H, Girard J, Leroux JP. Role of the mitochondrial metabolism of pyruvate on the regulation of ketogenesis in rat hepatocytes. Metabolism 1983;32:40-48. 21. Baal MG, Gabreels FJ, Renier WO, Hommes FA, Gijsbers TH, Lamers KJ, Kok JC. A patient with pyruvate carboxylase deficiency in the liver: treatment with aspartic acid and thiamine. Dev Med Child Neurol 1981;23:521-530. 22. McGarry JD, Robles-Valdes D, Foster DW. Role of carnitine in hepatic ketogenesis. Proc Natl Acad Sci U S A 1975;72:4385-4388. 23. McGarry JD, Foster DW. In support of the roles of malonyl-CoA and carnitine acyltransferase I in the regulation of hepatic fatty acid oxidation and ketogenesis. J Biol Chem 1979;54(17):8163-8168. 24. McGarry JD, Foster DW. Regulation of hepatic fatty acid oxidation and ketone body production. Annu Rev Biochem 1980;49:395-420. 25. Ruderman NB, Saha AK, Vavvas D, Witters LA. Malonyl-CoA, fuel sensing, and insulin resistance. Am J Physiol 1999;276:E1-E18. 26. Jang SH, Cheesbrough TM, Kolattukudy PE. Molecular cloning, nucleotide sequence, and tissue distribution of malonyl-CoA decarboxylase. J Biol Chem 1989;264:3500-3505. 27. Louis NA, Witters LA. Glucose regulation of acetyl-CoA carboxylase in hepatoma and islet cells. J Biol Chem 1992;267:2287-2293. 28. Ravina A, Slezack L. Chromium in the treatment of clinical diabetes mellitus. Harefuah 1993;125:142-145. 29. Watson JA, Fang M, Lowenstein JM. Tricarballylate and hydroxycitrate: substrate and inhibitor of ATP: citrate oxaloacetate lyase. Arch Biochem Biophys 1969;135:209-217. 30. Ahmad A, Kahler SG, Kishnani PS, Artigas-Lopez M, Pappau AS, Steiner R, Millington DS, Van Hove JL. Treatment of pyruvate carboxylase deficiency with high doses of citrate and aspartate. Am J Med Genet 1999;87:331-338. 31. DeVivo DC, Haymond MW, Leckie MP, Bussman YL, McDougal DB Jr, Pagliaro AS. The clinical and biochemical implications of pyruvate carboxylase deficiency. J Clin Endocrinol Metab 1977;45:1281-1296. 32. Chauhan J, Dakshinamurti K. Transcriptional regulation of the glucokinase gene by biotin in starved rats. J Biol Chem 1991;266:10035-10038. 33. Hue L. The role of futile cycles in the regulation of carbohydrate metabolism in the liver. Adv Enzymol Relat Areas Mol Biol 1981;52:247-331. 34. Langhans W, Pantel K, Scharrer E. Ketone kinetics and D-(-)-3-hydroxybutyrate-induced inhibition of feeding in rats. Physiol Behav 1985;34:579-582. 35. Rossi R, Dorig S, Del Prete E, Scharrer E. Suppression of feed intake after parenteral administration of D-beta- hydroxybutyrate in pygmy goats. J Vet Med A Physiol Pathol Clin Med 2000;47:9-16. 36. Scharrer E. Control of food intake by fatty acid oxidation and ketogenesis. Nutrition 1999;15:704-714. 37. Niijima A. Glucose-sensitive afferent nerve fibers in the liver and their role in food intake and blood glucose regulation. J Auton Nerv Syst 1983;9:207-220. 38. Barzilai N, She L, Liu BQ, Vuquin P, Cohen P, Wang J, Rossetti L. Surgical removal of visceral fat reverses hepatic insulin resistance. Diabetes 1999;48:94-98. .